Mystery Worshipper: Andy the Albanian. The church: St James Cathedral, Chicago, Illinois, USA. Denomination: The Episcopal Church, Diocese of Chicago. The building: A fairly small but beautifully formed cathedral in Joliet limestone. 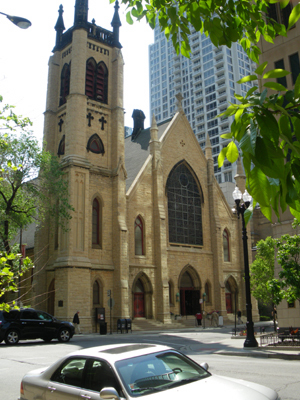 The current St James was rebuilt after the Great Chicago Fire of 1871 destroyed all but the bell tower and some walls of the previous building, consecrated only weeks previously. The interior is airy and open, with no pillars to obstruct the view. 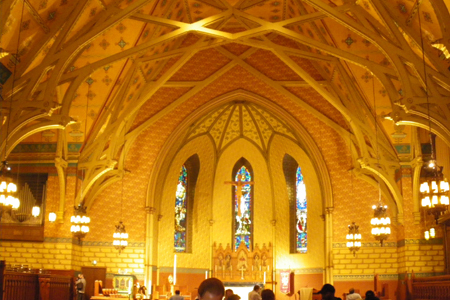 Intricate roof beams and fine painted-glass windows dominate throughout. The walls are covered with what some have called the best example of recreated Victorian stencil work in the world – and very fine it is too. The layout is traditional, with pews in the nave and the stalls for the professional choir filling the north transept. The church: Two eucharists are celebrated each Sunday, with choral evensong sung once each month. The eucharist is also celebrated three days during the week, with Wednesday's celebration including a healing service. They sponsor all the usual ministries and outreaches – see their website for details. Of special note is Summer in the City, a summer camp program that offers city youth a wealth of cultural and recreational activities. Tuition is out of reach for some, but scholarships made possible by the generosity of the congregation help to ensure that no child need be denied this opportunity. The neighborhood: The cathedral is in the affluent Gold Coast neighborhood, a couple of blocks from the temple of American consumerism, the "Magnificent Mile" of Michigan Avenue shops. The cast: The Revd Dr Elaine S. Caldbeck, assisting clergy, celebrated and preached. Assisting were the Revd Deacon Jackie Lynn and Mr Kevin Godsil as subdeacon. The date & time: Sunday, May 24, 2009, 10.30am. Perhaps a third full, I'd guess around 150 worshippers, not counting the 30-strong choir. One of the ushers interrupted her conversation with her colleague for long enough to give a staccato "Hi" in response to my "Good morning." Does that count? A nice soft cushion and a nice big kneeler made for comfort throughout. Chat was confined to the narthex, so inside the cathedral the atmosphere was prayerful and quiet. A 12-page service booklet and newsletter, and the Hymnal 1982. Organ – and what an organ it was! The celebrant and deacon were both quite small ladies, while the subdeacon must have been 6'6" tall and almost that around the chest, so it did sometimes look like a puppet show. And I never saw the subdeacon's lips move. The organ was rather overpowering at times, particularly the fanfare at the start of the first hymn from the trompette en chamade above the west door. High Anglican, but not stuffily so. Their website describes it to the letter: "While we glory in the ancient liturgical and musical traditions of the Episcopal Church and the Anglican Communion, we also work to understand the myriad ways in which Our Savior is known and worshipped throughout the world. Our worship is always interesting, often beautiful, frequently moving, and always warm and embracing." 7  The celebrant was clearly reading her sermon, and there were no particular highs and lows in the delivery, but she was easy to listen to. The uncertainty of "in-between" times. Liturgically, we are between the Ascension and Pentecost. Soldiers' families are especially "in-between," and economically we are all so. Jesus was "in-between" as he prayed in the Garden of Gethsemane. In all such times we have support from each other and from God. We're called to stand together, to support one another, and above all to pray, as Jesus did in Gethsemane. The professional choir sang beautifully, and despite my nitpicking in answer to the next question, it was an uplifting, prayerful service that I was glad to have experienced. The intercessions, with their sung response, the bright "ting" of a bell before and after each response, and the rather formulaic biddings, didn't really feel much like prayers. Not a lot – which was surprising given that Midwesterners have a deserved reputation for friendliness. There was a buzz of chat among the people in the narthex taking coffee, fruit punch and cakes, but nobody made any effort to speak to me. It wasn't coffee weather, but the fruit punch was delicious, as were the cakes from a bakery that gives half its profit to Chicago House, a charity for the homeless and HIV sufferers. 6  St James ticked most of my boxes – catholic liturgy, great music, a relaxed and inclusive atmosphere, and Mother Elaine was charming in the handshake line afterwards. So I'd give it a go, but it didn't quite work for me on this occasion. I think perhaps it was all a bit too comfortable. The huge bear of a subdeacon towering over the rest of the altar party.